Having an updated Will is crucial! Keeping an updated Will is highly important. Any time you or any of your family members experience a major life change, it is crucial that you review your Will. 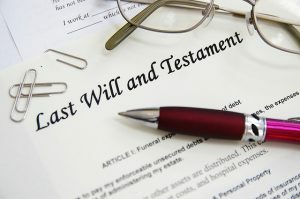 If you experience any of these changes and do not update your Will before you pass away, your legacy may not be carried out in the way you would have wanted it to be. How do I update my Will? It is simple. 2. You can sign a codicil to the existing Will. It’s the morning of much-anticipated Super Bowl XLIX, and as fans in Patriots gear buzz about this coffee shop, a certain attorney can’t help but think about some of the legal implications of this huge game. Just like Patriots fans on Super Bowl Sunday, contracts, and the law regulating them, are everywhere around us. The legal concept looms over the purchase of my dark roast coffee with a shot of espresso. It governs the relationship between customer and cable provider, which allows you to watch the game. And it’s ever-present for the hundreds of NFL fans who suddenly lost the opportunity to witness this historic event live in Glendale, AZ. While acknowledging that many worse realities litter our newsfeeds every day, I was saddened to read recently that many fans who purchased Super Bowl tickets will not be able to enjoy the experience. It’s a common practice for resale brokers to sell a ticket to a sporting event, with the assumption that they’d acquire the already “sold” ticket at a later date from a third party, at a price point that results in a profit on the original sale. Confused? So are the hundreds of unsuspecting and now “SOL” football fans who were notified in the last few days that the broker they bought Super Bowl tickets from were unable to fill their order, due to terribly unfavorable market forces.1 Tickets were far harder to come by, and were being sold at far higher prices than the resale brokers expected. This unfortunate reality has left fans empty handed… many of whom had already boarded a plane and arrived in Arizona, and all of whom had made sacrifices, plans and promises to be in attendance for this event. So what happens now? What is their recourse? Contract Law is littered with a process-based chain of events, definitions, etc. that the average person rather not fully dive into. Not a problem… the cliff notes version will be more than sufficient to get the point across. When the rabid Patriots or Seahawks fans input their credit card information and waved “goodbye” to thousands of dollars in exchange for a ticket that would be received in the mail at a later date, a contract (or legally enforceable promise) was formed. Flash forward a week, when the ticket broker was ultimately unable to produce the purchased item, we have our breach of contract. The default rule in breach of contract situations is that the “injured” party will receive “compensatory damages” from the breaching party. Not to spoil the surprise, but compensatory damages are a monetary award designed to compensate the injured party as a result of the breach.2 This award includes the party’s expectation damages, which is analogous to your typical “reimbursement.” For example, if a fan paid $2,000 for a ticket that never came, the resale broker must compensate that person for the lost $2,000. Shocking, right? An injured party is also entitled to “consequential damages.” This incorporates indirect expenditures that the person made in reliance of the contract. In this situation, consequential damages would reimburse a fan for the plane ticket he/she purchased to go to the game, for example. The damage must “flow from the breach,” and be reasonably foreseeable to both parties at the time they entered the contract. So, although the ticket broker would likely be on the hook for the fan’s Glendale hotel room, they’ll dodge a bullet with regard to the $5,000 VIP club access pass purchased for the night before the game. Contract Law remedies are designed to retrace steps in an effort to put the injured party back in the same financial place they would be had the contract been properly performed. Many argue that this approach doesn’t account for emotional damage and disappointment, and they are correct. Years ago, a group of decision-makers, who probably had far more grey hairs and thicker spectacles than I do, decided that inflating damages for the purpose of punishing the wrongdoer, or softening the emotional blow on the non-breaching party, was not a core consideration in breach of contract cases (absent fraud). Hopefully you made some Super Bowl caliber memories by reading this blog entry. I can promise you, no compensatory damages will be awarded for your lost time. Until next time, Wiley Etter, LLC wishes you all the best. Giving away your home to your children before you pass away can have major tax consequences and prevent legacy planning opportunities. In spite of this, many people follow outdated advice of giving away property before they pass away. Historically, estate and death taxes were applicable to most of the population. Today however, the Federal estate and gift tax exemption sits at $5.34 million per person. Many states have no estate and gift tax and those that do also have exemptions ranging from low to high. It is estimated that 99.7% of the population will not be subject to estate taxes. Thus, planning for the distribution of your assets to your family has changed. On the contrary, if a home (or most other property) is inherited after the owner passes away, the person inheriting the property gets a “step up” in the tax basis. This means the basis would be the current value of the property. Thus, if you or your parents are not likely to be subject to estate taxes, inheriting the property through their estate can have significant capital gains tax savings. Beyond the tax consequences, gifting a house to you can affect your parents’ eligibility for Medicaid coverage or long-term care. There are other options for giving a house to children, including putting it in a trust or selling it to them. Trust planning also allows parents to provide asset and wealth protection to their children. Before you or your parents give away a home, you should consult with one of our attorneys, who can advise you on the best method for passing on their home. Attorney Wiley believes in working with a wide range of specialists. It is difficult to be the best at everything; so, we frequently work with other attorneys to ensure that our clients obtain the highest level of care. While Attorney Wiley helps many of our clients with elder care issues we often bring in Hank Weatherby to assist with more complex cases. Hank is an industry leader in the field and we often trust our clients to his care. Hank Weatherby, recently wrote an article on a new Connecticut law and the potential to be sued by Nursing Homes which we felt would be beneficial to our community. If you have any questions about medicaid or Eldercare and you would like to setup a meeting with Hank at our North Haven office do not hesitate to contact us. The Connecticut legislature recently passed a new law concerning Medicaid eligibility which allows nursing homes an additional basis to sue to recover lost revenue because a resident, or their spouse or agent under a power of attorney, transferred his or her assets to a third party. The law goes into effect October 1, 2013, but on its face it appears to apply to gifts and other transfers made in the two years before that date. Attorney Wiley is a participating speaker at monthly workshops put on by W.I.N. (Women’s Independence Network) which provide free professional advice to divorced women or women in the process of divorce. As part of our estate planning practice, one of our top priorities is to empower families to build a legacy that instills values and dreams for their children and grandchildren. As such, we thought it fitting to provide a guest post by one of our co-speakers at W.I.N., Steven Cessario. Steven is the founder CT Youth Mentoring & Development where he provides mentoring and coaching for young people. 4 Strategies Every Parent Needs to Know!